With every business transaction there’s a process…. A ‘should be’, methodical way, of going through the steps of what you want, what you need, and what will happen with your business solutions, but unfortunately with most companies the personal magic never happens. Not with us. Lybelle Creations discusses all of these scenarios with you to discuss every and all routes to get you and your business recognized in the business market, and we strive to do this on a personal level. You contact me – I contact you….We discover each others business’s goals and we schedule to meet and discuss our business relationship. You -the client- and myself meet to discuss the job involved. We go over your needs, a time-line, and what it is you would like to see as the end result. the project. This consultation is free. Once the project is agreed on, a contract is signed. $200.00 or 20% -whichever is less- of the cost of the project is due at this time to get you started. Design of the site or project begins and the business transaction begins to unfold. This is the time we collaborate and assist you in gathering all the content, images and graphics for a website. If the project is a logo or other creative solution, this is where the colors and creative design starts to take shape. Based on your feedback, I start revisions for the final construction. a dummy website for you to visualize exactly how it will appear on the web and you are now involved in its procession. 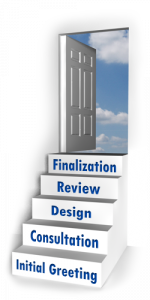 For other projects, a final review will be sent via email or in person to give a final once-over. The project is then sent to the printer for production if applicable. Once the project is complete a copy of the website or other item will be delivered via CD to you if applicable. Congratulations! You’ve just been involved in a creation of something made just for you!